Total agreement as to what channel to watch in the doctor's office. For most of the day I watched on the small screen of my laptop. 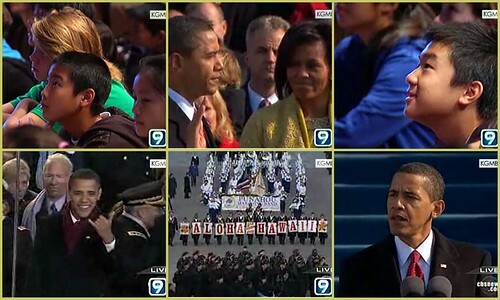 These were fuzzy screen captures, but the emotion still came through strong and clear. 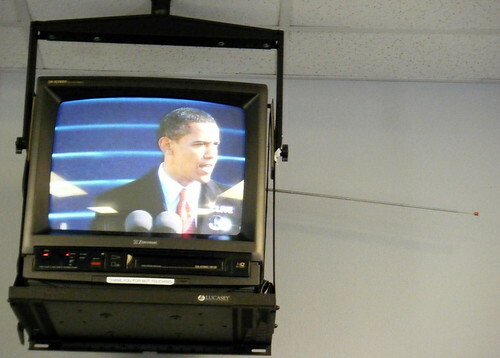 I watched the Inauguration Ceremony on Cnn TV, not in German TV, in order to hear Obama in the original language, not in a German translation. I was very moved by his speech. Many Germans are not used to this kind of rhetoric, and I myself can’t imagine any German politician using that kind of language. I also liked the musical program, especially Aretha Franklin. One of my dreams for our future Ulla, is that there are more world leaders who capture the global attention President Obama has: We Americans certainly do NOT “have the market cornered” on leadership! I like to think that Barack Obama’s success will inspire other emerging leaders as well.